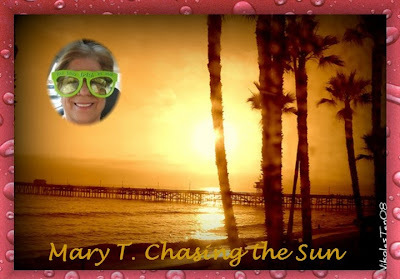 Our Teach, Mary T.is not home but she has left us a Ruby Tuesday post and requests your visit. She will be very busy this Friday when she turns on her computer! Do you mean Mary T, that you and your sweetheart left this lovely white New York for Florida? Here leaning against the veranda is our over worked, ruby colored snow shovel. Beside it you can see a thick icicle that has fallen from the eavesdrop and landed into the snow bank below. If you click on to the picture, you can see it better. Bernie has shovelled a path to the bird feeder.I wonder why the birds have been avoiding that bird bath. Usually, Bernie clears the snow off of it so that the sparrows can have a wee skate once in a while, but it has been soooo cold! Yes, and also in the meantime, the water pipes are frozen solid and our little laundry room has been rendered useless.We have to go to the Laundromat now! Bernie doesn't mind though except that the price of washing the clothes comes off of his twenty dollar a week allowance. I guess it is time to give him a five dollar raise but we are going through financial hard times [not really! ], so I will give him a two buck raise and that is it! Thirty-seven years almost, the poor guy has been doing the laundry! The little red car sits frozen solid! I hope that this sad account has made the Teach feel a little guilty. Not fair, that while we are all freezing, she is getting sun burned somewhere down south....a ruby red sun tan at that! I'm back! 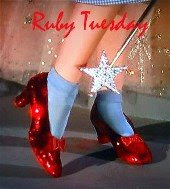 I don't know what the Ruby Tuesday means..but your 'ruby' colored snow shovel is delightful! Good thinking....=) I'm so sorry to hear your water pipes are frozen up and your sweetheart has to go to the laundromat though. Love his allowance.. Thanks again for the BDay post. I brought my hubby in here to see the singing cat and didn't realize there was that beautiful card & cake and more kitties. Loved it all, what fun! Thanks again Terry, you've made this birthday extra special. Those singing kitties are so cute and I know how you just love cats! Did you tell me once that you are allergic to them?...I can't remember. I know Mrs. Mac is. Happy Freezing Cold Day to you! Love the red snow shovel against the snowy white background! sorry about the frozen water pipes. Bernie seems to take it with a warm smile. He is a cool guy. His wife a cool hearted reporter, cutting back on his allowance. He's working over time, that means more money, not less. I think you must be the hardest editor north of tthe border. One could say you are working triple too; journalist, photographer and director. In two months we'll await spring. I like them words in the first of your post when you said Me and My Sweetheart ! Its about time you give The man a little more respect ? You might better give Him a $5.00 raise before He goes on strike ? Oh that is so cold. My sister 's door bell got frozen. Can 't imagine how cold it must be. This week i did not do a Ruby photo too. wow !! look at all that snow!! i LOVE LOVE the SNOW!! Im hoping for at least ONE more good Round of snow here! we got ICE and then some snow yesterday!! Oh I wouldn't mind some sun, although I'd be happy with sun and plenty of snow this time of the year. The icicles one the veranda look kind of scary and sorry about those frozen pipes, that must be tough indeed. doesn't the red just show up even more, in the white white snow!!!! and i see by the news that you are getting MORE of that white stuff! keep that shovel handy and that little red car off of the 401! Gosh, Miss Terry, giving Bernie a two buck raise is mighty wide of you ;) He might get used to it once the pipes unfreeze and start pocketing the extra money! I'm in Paradise now (no, not heaven) ... just visiting my folks in the sunny town of Paradise. They would welcome the snow here. It's been so dry in this area way too long. But it is almost seventy degrees F ... a nice enough temp. You did a nice RT here, Terry. I do like your red snow shovel! I am wondering if that could be due to your very skillful photo editing. It could be doctored up via computer. Terry, I got a beautiful surprise when I got up this morning and found your comment on my blog. Thank you! I was delighted in fact...and so happy that we could connect through the comment I left for Felisol. Without our faith, death would be so horribly final, frightening and ugly. We are blessed by knowing Him. I did not know that about my name, thank you for the information and that you took the time to look it up. You RT photos are gorgeous, so much snow and you live in New York? It looks like outside of the city. How close to do you live to NY? Looking froward to more contact and Ruby Tuesdays.